While meeting a few climbers at the beginning of a trip recently I was told, "We were just reading about you." I was surprised until shown the article (below) when I remembered Lyra interviewing me last winter. 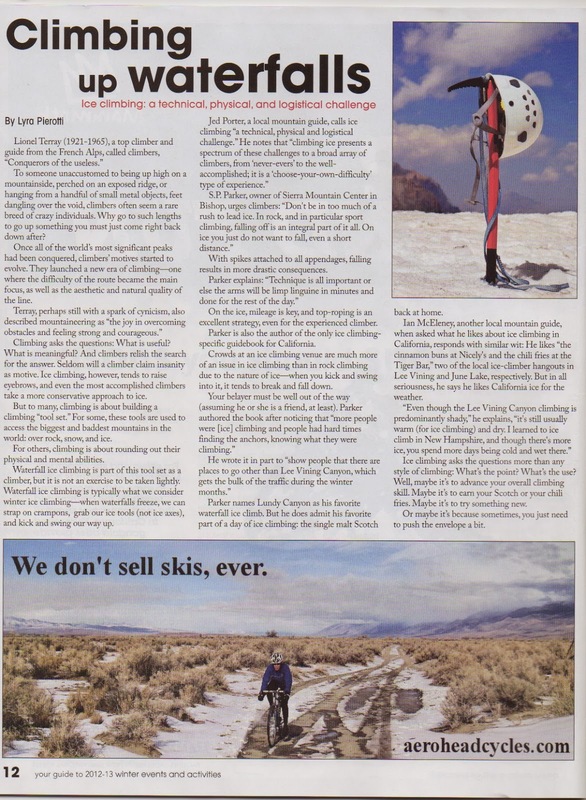 From the winter edition of Welcome To The Eastern Sierra. The Roadside Ice in June Lake is in great shape right now. It's also even more roadside than usual. The June Lake Loop road is open, so a climber can park about 10 seconds from the base of the ice. I was there the other day and my partner didn't even bring a pack. We geared up at the truck and away we went. A 60m rope works for some of the anchors but a 70m is necessary if you want the most options. Boy Scout Falls on January 3.